Women who are about to give birth may be pleasantly surprised to hear that they have more pain relief options in a growing number of birthing clinics across the country. Though nitrous oxide (also known as “laughing gas”) may be something you are used to being offered at the dentist, the pain-relieving drug is now being disbursed to women in the throws of labor with a “so far so good” approval rating according to many of those who have tried it. Today reports about the growing trend of using laughing gas instead of epidural during child birth and how we may see more clinics offering nitrous oxide in the future. What do you think of adding the option of laughing gas at hospitals and birthing clinics for women in labor? 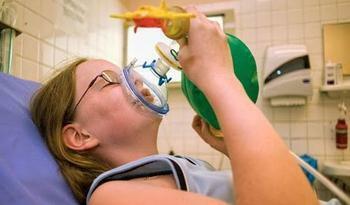 Do you think nitrous oxide will become a popular pain reliever for women giving birth?